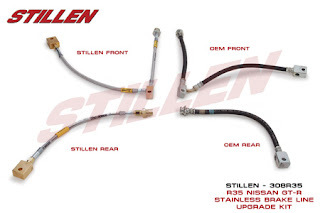 Stillen has just started to offer stainless steel brake lines for the R35 GT-R. Stainless steel brake lines improve pedal feel, and remove the softer rubber lines that expand with pressure. New from STILLEN: Racing-bred stainless steel brake lines for the Nissan GT-R! This is the first brake line upgrade on the market that does NOT require removing the factory hard lines. Stainless steel braided lines are stiffer than the typical rubber brake lines, but nothing is stiffer than hard steel tubing. That is why it is important to keep the hard lines in place for the firmest, most responsive brake pedal feel.